This Easter Sunday in Florence the centuries old tradition of the “Scoppio del Carro” will take place with a few changes from past years, changes just announced a few days ago. The main change concerns the lighting of the “sacred fire” which will be moved from Sunday morning to Saturday evening to be present already at the wake that takes place in the cathedral as we await the arrival of Easter. The change is intended to “restore the most profound significance of the rite and its symbolic and spiritual meaning” that over time might have changed the event into a bit too much folkloristic ritual”, according to the auxiliary bishop Claudio Maniago. Another slight change will take place within the cathedral: the lustral waters will be spread at the start of eucharist on Easter morning instead of at the end before the cart is lit. Slight changes but we thought they would be useful to know about. The parade in historical costume that accompanies the cart on Sunday morning will continue as it always has, with Mayor Matteo Renzi taking part. So if you’re in Florence on Saturday night, starting at 9.30pm, a parade will take place from the Church of the Santi Apostoli e Biagio to the Duomo where the three flints will be used to light the sacred fire and blessed by the Cardinal Archbishop in front of the cathedral. The flints and fire will remain in the cathedral throughout the wake that takes place all night. Easter Sunday and Monday: Are museums open? Uffizi Gallery (where there’s crurrently an exhibition dedicated to beautiful tapestries), Accademia Gallery, Palatine Gallery, Museum of San Marco, Bargello Museum, Silver Museum and the Boboli Gardens, the Medici villas, the Last Suppers of Andrea del Sarto and of Sant’Apollonia. On Easter Monday, visitors can also enjoy: Uffizi Gallery , Accademia Gallery, the Medici Chapels, the Orsanmichele church and museum, the Boboli Gardens, the Palazzo Davanzati Museum, the Last Super of Ghirlandaio in Ognissanti, the Cloister of the Scalzo and the Medici villas at Castello, Petraia, Poggio a Caiano and Cerreto Guidi. Not a state museum but definitely also worth visiting for the current “Americans in Florence” exhibition: Palazzo Strozzi will be open on both days! 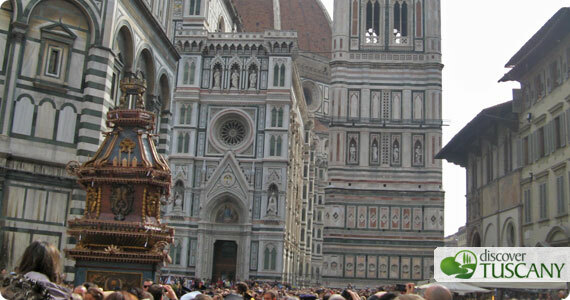 If the weather permits, Easter Sunday and Monday is a great time to go out and about and explore Tuscany. In particular, we have a list of museums and places in Mugello that will be open so that you know you can enjoy this weekend!